Good morning. Happy Thursday to you all! I’ve been away for a little while working on some awesome ministry assignments. God is truly in the blessing business. If you want to go higher in life, strive to be more like CHRIST! Be sure to “Like” Sunshine’s Reflections on Facebook to receive daily scripture post. Don’t forget to set aside a daily devotional period. It is important to feed the spirit daily. There is more to being a Christian than lip-service. Quoting scriptures is great, attending church weekly is awesome; however, what good is it to be filled with so much word that you are of no earthly good to the people around you? A lot of Christians talk a good game, but have you ever been able to feed a hungry person with words? Have you ever been able to cloth a person with prayer? I would step on a limb and say NO! The bible says in James 2:16, If one of you says to them, “Go in peace; keep warm and well fed,” but does nothing about their physical needs, what good is it? Prayer is great and we should do it daily; however, there comes a time in our Christian walk that we have to attach action to our prayers and scriptures. When Jesus walked this earth, He was the perfect example of someone who served others. I have great news, serving others doesn’t require a lot! You can start with what you have! Do you like reading? Have you ever considered reading to children who are less fortunate than you? Perhaps serving at a food kitchen would suit you. Have you ever thought about standing around at the grocery store and helping the elderly get their bags in their car? Perhaps you are a great singer, dancer or poet, have you ever considered going to the nursing home and sharing your gift with others? Do you and your friends have an abundance of clothing? Have you ever thought about doing a quarterly clothing drive and taking the items to victims of domestic abuse? The possibilities are endless when it comes to serving others. I urge you as children of God, if you see a need ask God to help you fill the need. If everyone did something for someone else how much better would the world be? What can you do TODAY to serve others? How can you lend a helping hand on a regular basis? In January of this year, I came across an article about homeless women and how they struggle during their menstrual cycle due to lack of resources. It never crossed my mind how tough that could be for women and girls who are homeless; however, that story tugged at my heart and I DECIDED the moment I finished reading the article that I would do something. I didn’t have to pray on it, I didn’t have to check my bank account, I didn’t have to figure out where I would donate, I simply made a decision. The timing was perfect because my heart was sensitive to a need. 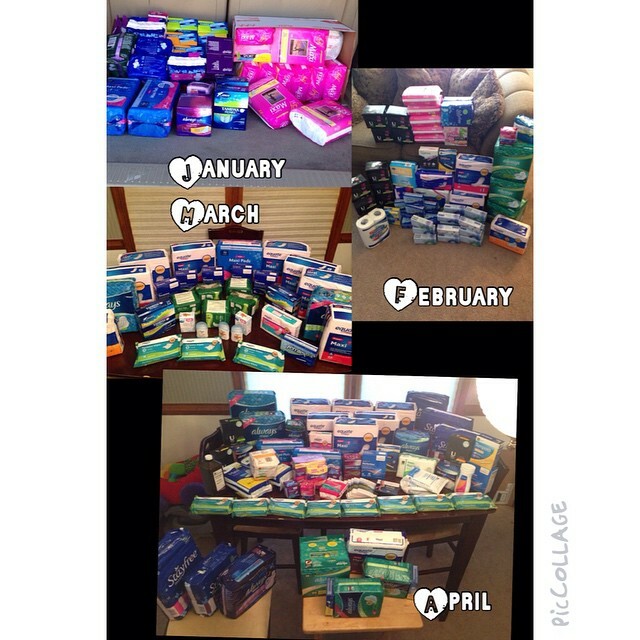 So, I put the word out on social media and word-of-mouth that EVERY month I would collect sanitary products for women and girls who are homeless. I didn’t know who was going to help or if anyone was going to help, but I did know that EVERY month I would give my contribution to the local homeless shelters and/or organizations that service those in need. What started out as a few donations from a few people has grown in a few short months. I’m here to encourage you all to tap into your gifts and talents and begin serving others. Don’t look at the quantity, but look at the condition of your heart. The women who received these items were overjoyed that people would take time and money to collect sanitary products for them. Now that’s LOVE! Again I ask, how can you serve others TODAY! May God bless you as you seek to bless others!